Capri is an island so enchanting that it was used as an idyllic retreat already in the first century AD, when the emperor Tiberius would escape to one of his twelve villas scattered on the hilltops overlooking the Mediterranean for a bit of respite from the chaos of Rome. And who are we to argue with Tiberius? Two thousand years later, visitors still flock to this fairytale spot just off the coast of Naples, with its sweeping view over the entire expanse of the Gulf of Naples and the Amalfi Coast and dramatic shoreline dotted with secret coves and sea grottoes. Unfortunately, Tiberius may have been a bit too right, as the island can seem overrun by paradise-seeking travelers during the high season summer months. But in the quieter spring and fall, especially as evening falls and the day-trippers have all caught the last hydrofoil to the mainland, the island still captivates with its timeless languid beauty, lush gardens, and endless horizon. We strongly recommend you resist the temptation to visit Capri in a single day, but instead spend a night or two winding down into the island pace by day, and soaking in the cosmopolitan island culture by night. 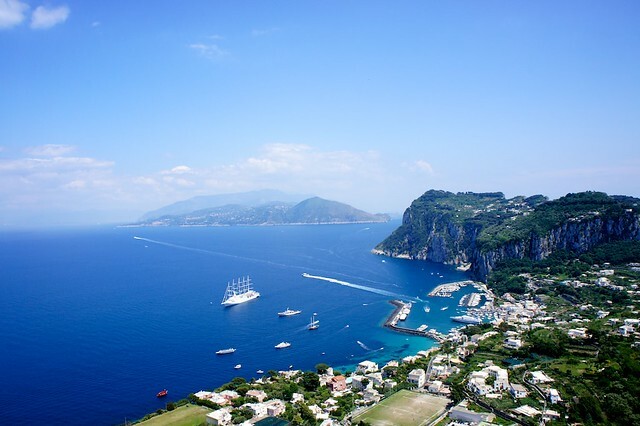 Capri has a long history of luminary residents and visitors, many of whom have left traces of their time here in the form of sumptuous villas and gardens. Tiberius’ villas: Most of the Roman emperor’s villas have been lost, but the remains of two are relatively well-preserved and interesting to visit. Villa Jovis, Tiberius’ largest and most sumptuous island residence, was uncovered in the 18th century and fully excavated in the 1930s. Most of the artifacts found here are now in Naples’ Archaeological Museum and the Church of Santo Stefano on Capri, but the structure, with its separate wings for royalty and servants, baths, and throne room, can still be visited. Be forewarned: it’s a long uphill walk to the site at the top of Mount Tiberius, but the views are worth it. Otherwise, the much less complete remains of the Villa Damecuta sit on a rocky cliff almost directly above the famed Blue Grotto, near Anacapri. Most remarkable is the villa’s loggia, still intact and still with a breathtaking view two millennia later. Villa San Michele: This jaw-dropping villa built to measure by Swedish physician and writer Axel Munthe was his life-long dream, as told in his classic book, “The Story of San Michele”. Located on one of the most panoramic spots on the island, and surrounded by a number of loggias, pergolas, trellis-covered colonnades, and a flowering garden, this otherworldly corner of the island was Munthe’s home for more than 50 years, where he hosted a number of dignitaries and celebrities. Now a museum, visitors can admire his collection of antiquities—when, of course, they can tear their eyes away from the incredible views. Don’t forget to rest your left hand on Munthe’s sphinx statue, look out to sea, and make a wish! The Gardens of Augustus and Via Krupp: These botanical gardens, forming a series of flowering terraces down the steep cliffside to the sea, and the much-photographed Via Krupp, a steeply descending walk made of a series of hairpin switchbacks zig-zagging 100 meters down the cliff to Marina Piccola below, are both the work of German industrialist Friedrich Alfred Krupp, who commissioned them in the early 20th century when he would summer each year on the island. Via Krupp is currently closed due to a danger of falling rocks (though still an amazing feat of engineering admired from afar), but the gardens are open and an excellent sample of Capri’s rich flora. The Charterhouse of Saint James: Even men (and women) of the cloth have left traces of their passing, most spectacularly in this 14th century monastery in the heart of the town on Capri and just steps from the Gardens of Augustus and Via Krupp. One of the oldest intact buildings on the island, the charterhouse has been everything from a religious site to a barracks, jail, and military hospital. 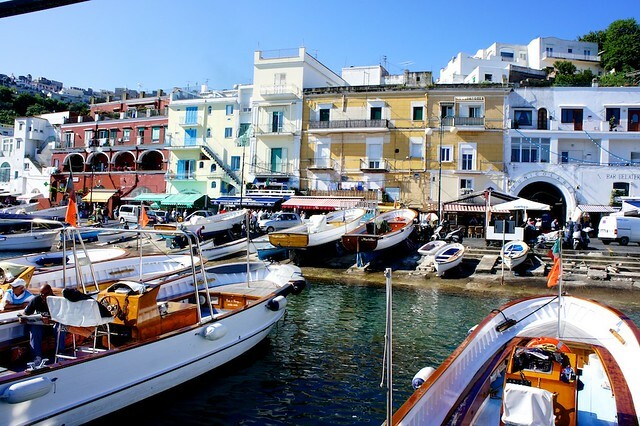 Today it is a serene oasis in Capri’s bustling center, where visitors can admire the complex and cloister, Roman statues recovered from the floor of the Blue Grotto in the 1960s, and a small collection of modern art. Though the island has a number of sights worth a visit, by far its most spectacular can only be seen from the water. 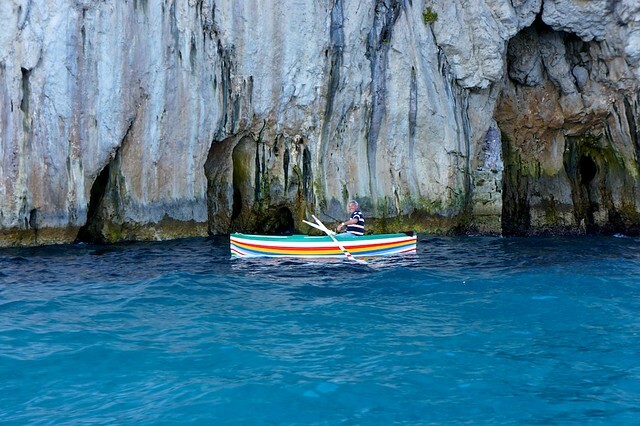 The Blue Grotto: Capri’s most popular attraction is the Blue Grotto, and it only takes one visit to understand why. 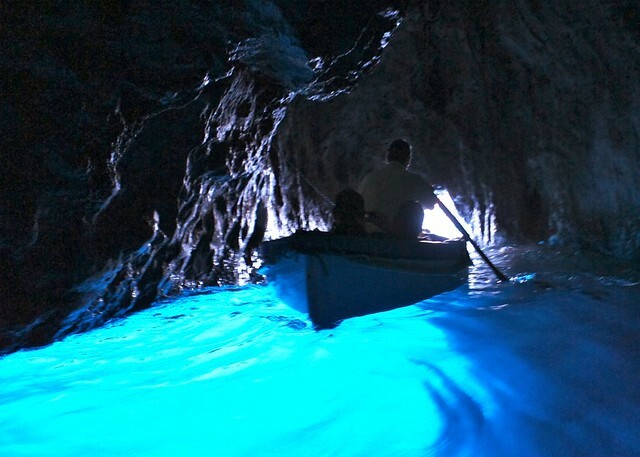 Accessible only by sea (and only in small rowboats manned by local skippers who have passengers lie back while they maneuver their wooden boats through the low cave mouth), this sea cavern is lit by a second opening below water, through which sunlight is filtered inside, lighting the water with an unreal azure glow. Lines to enter can get long in the summer, but this otherworldly experience is worth the wait. 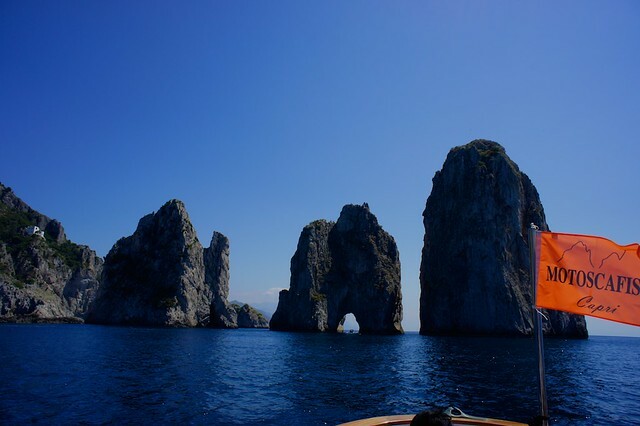 The Faraglioni: Perhaps Capri’s most iconic symbol, these three towering sea stacks off the coast are dramatic by land (a snapshot from the Punta Tragara or Filosofi scenic overlooks is a must), but especially memorable if visited by boat. 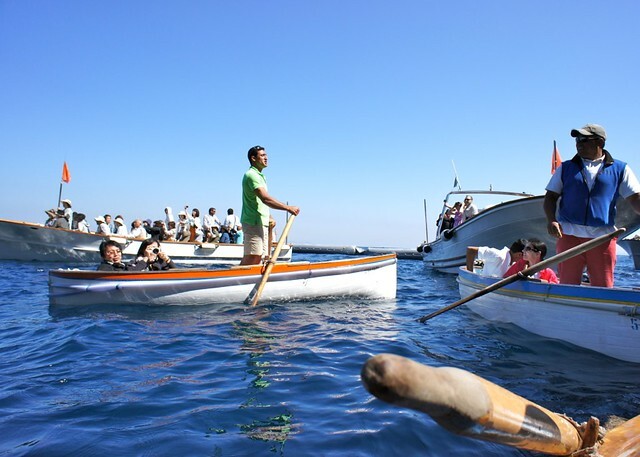 Smaller boats can pass directly through the natural stone archway of the central rock formation (kiss your sweetheart for good luck while passing under), and can dock at the beach directly opposite for a waterfront meal with a view. Capri has some of the most scenic walking routes in Italy, from easy and challenging, which wind their way around the foot of Mount Solaro (the highest point on the island and reachable by chairlift) and along the coast. Pizzolungo: Tracing the coastline between the Tragara scenic overlook and the Natural arch, this is one of the most beautiful walks on the island. The final leg includes a steep flight of steps to the Matermania cave and another flight to the Natural Arch rock formation. Migliera: This footpath leads to the Tuono scenic overlook, winding its way through a landscape of vineyards and orchards outside Anacapri, the island’s second town, on the slopes of Mount Solaro until reaching the scenic overlook above Punta Carena and Capri’s lighthouse. 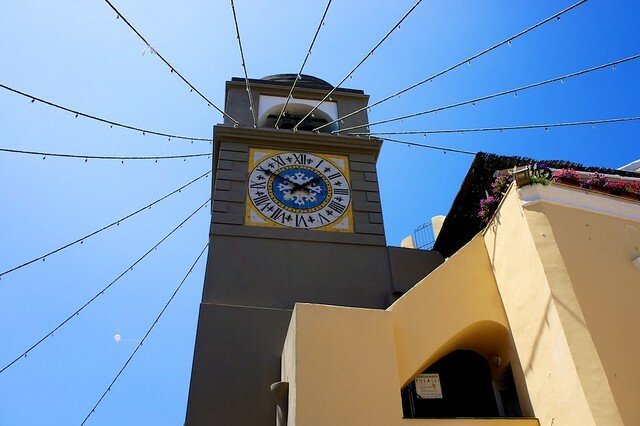 We would be remiss to neglect one of the aspects of Capri for which the island is best known: its cosmopolitan nightlife. 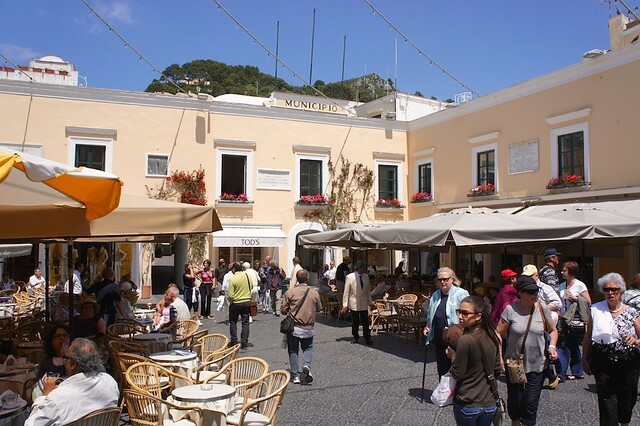 The Piazzetta: In Capri, the island’s main town, the tiny square hosts a disporportionate number of glitterati for much of the year, and visitors stopping for an evening aperitivo here will likely be sitting elbow-to-elbow with Hollywood stars and European royalty. If you haven’t had your fill of celebrity sightings, wander down the nearby Via Camerelle, lined with luxury boutiques and designer shops. Restaurants: Despite living almost exclusively on tourism, Capri’s restaurants remain excellent just don’t go looking for a bargain. Many specialize in fish and seafood, or traditional island or regional cuisine, and a number have pretty internal candlelit courtyard seating or dramatic terraces with a sea view for a truly spectacular meal.